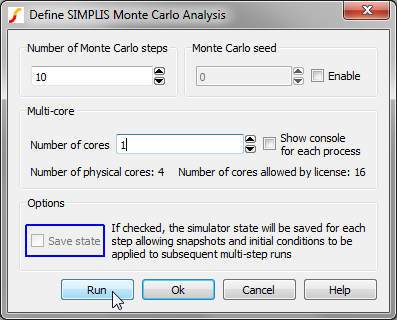 With the introduction of SIMetrix/SIMPLIS Version 8.10e, you can save the state of Multi-Step and Monte Carlo simulations. In this context, "Saving state" means that the simulator creates an array of simulation files, including files which contain snapshots and initial conditions. Each simulation step or seed value has an associated set of simulator files, saved in the SIMPLIS_Data directory. 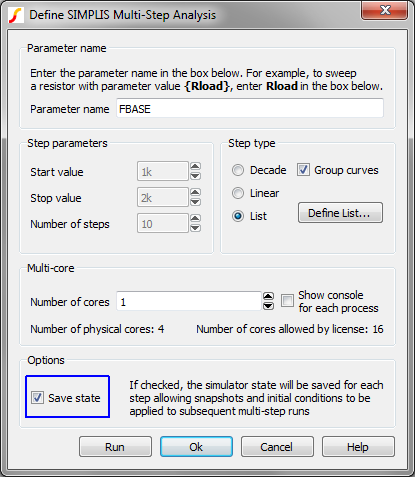 These simulation files have file names based on the stepped parameter names and values for a multi-step simulation whereas for a Monte Carlo simulation, the file names includes the seed value. You can load snapshot information from the files. SIMPLIS automatically checks the simulation files and checks if there are any changes to the circuit and if relevant snapshots exist. If the circuit is unchanged (analysis directives are excepted) then SIMPLIS will automatically load the snapshot. For more information on snapshots, see the Advanced SIMPLIS Training topic 2.0 Transient Analysis Settings. Also, the "Force new analysis" checkbox on the Choose SIMPLIS Analysis dialog must be unchecked to load snapshots. Instead of loading the snapshot, you can include an initial conditions file. When you include an initial conditions file, you inhibit the loading of snapshots, and instead, initialize all reactive components. In order to load the file based on the stepped parameter values or seed value, you need to use a templated .include statement. This is described next. %DECKFILE% The deck file name, without any directory path nor file extension. %DECKDIR% The directory where the deck file is located. %DECK% The directory and deck filename, with a .deck extension. %NETLISTDIR% The directory where the netlist file is located. Typically this is the same directory where the deck file is located. %NETLIST% The directory and netlist filename, with a .net extension. Note: The keywords are not case sensitive. Important: To use the .include method for including initial conditions files, you must also specify a starting seed. This ensures that the Monte Carlo simulation uses a known set of seed values which correspond to the Monte Carlo simulation which generated the initial conditions files. Each resulting initial conditions file is named according to the parameter name and step value for a multi-step simulation, or with the seed value for a Monte Carlo simulation. You want to re-run the simulation, starting at the previous initial conditions. There are many reasons to do this - one is you might have a circuit which is difficult to get to converge in a POP analysis, and setting the initial conditions typically helps. The first simulation run could be a long transient, and the second simulation a POP analysis. You first run the long transient with the save state checkbox checked. Then for the second run, add the .include %deck%.init to the F11 window of your schematic. When you run the simulation, the netlist preprocessor includes the initial conditions file based on the current parameter name and step value. You also should be aware that initial conditions files in the SIMPLIS_Data directory are overwritten every simulation. During a Monte Carlo simulation, the program uses a pseudo random number generator to generate random numbers to seed the calculation of statistical distribution functions. The pseudo random number generator can be thought of as a very long sequence of numbers - picking an initial seed number will determine where you start on the list of numbers, and therefore what the future seed numbers will be. From this concept it's clear that to repeat a simulation, you need to provide an initial seed value, and once provided with an initial seed value, the seed values for the entire Monte Carlo simulation are determined, and fixed. For each parameter step or seed value, the netlist preprocessor resolves the %deck% keyword and includes the initial conditions file for the parameter step or seed value. The SIMetrix/SIMPLIS Design Verification Module automates the creation and inclusion of initial conditions files. This is accomplished through the GenerateInitFile and IncludeInitFile testplan entries. These entries automatically rename and make backup copies of the init files and add the correct syntax to include the files in a simulation run.